V.com weekend vote: If you could make a bowed instrument, what would you make? March 22, 2019, 1:38 PM · Look at your fiddle for just a second -- it's an amazing feat of craftsmanship, art and design. The shape is perfection in proportion; the mechanics are a miracle. Have you ever thought about what it takes to make one of these beautiful object? And if you had the time, know-how and a garage full of aged tone wood, what instrument would you want to make? As a violinist, I'm inclined to say "violin," but the again, wouldn't it be cool to make something giant, like a bass? Or how about making the bow? That sound absolutely fascinating. If you were to be inspired to make an instrument, one example to be follow with be that of a friend of mine, Dr. William Sloan. After a lifetime of violin playing and collecting, Sloan started making his first violin as a senior citizen! I've played them all, and they just keep better and better - by now he's working on his fifth fiddle, traveling every summer to Oberlin, Ohio, to participate in the annual Violin Society of America's Oberlin Acoustics Workshop! For this vote, please let use know what instrument you think would be really neat to make. And if you have already made an instrument or are a luthier, please vote for the instrument you made, or the current instrument you are making, and tell us all about it! If you wish you could make something like a 14-string viola d'amore, please choose the instrument that seems closest, and then let us know about it in the comments! March 22, 2019 at 08:29 PM · Viola. It's not just that I'm a violist (though that certainly helps) -- it's also that the viola, being necessarily a compromise instrument, lends itself to more creativity on the maker's part. 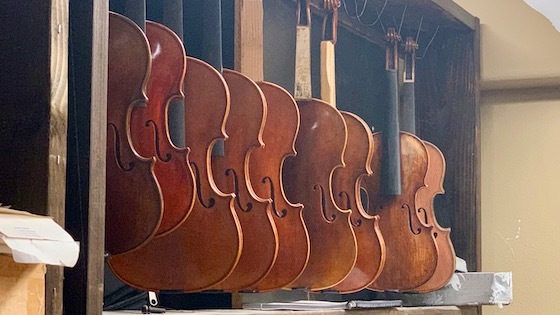 March 22, 2019 at 08:47 PM · I would love to make a violin, as well as a bow. The reason is simple, so that I could play on my own work and feel the satisfaction and hear the sound of one's hands. When I was in high school, about 16, I did manage to make a sort of "silent violin", which does not have a proper body to vibrate. The idea was to be capable of practising at late hours. I carved a neck and fingerboard. It came out not as I hoped, but interesting. The instrument wad playable, but as my technique grew, it became uncomfortable to me. Nonetheless, a beautiful art form. March 22, 2019 at 11:16 PM · I wouldn't have thought about making a bow, but I'm intrigued by the idea of making something whose creation process I initially know nothing about. I am intimidated about making a stringed instrument because I've read too much about instrument makers, all the considerations that go into an instrument's design, and how much trial and error goes into something that takes such a long time to make. March 23, 2019 at 12:16 AM · If I had the $$ I would commission a 5-string viola, which would sound great on second violin parts, and make those ridiculous high-note viola parts in modern orchestra music easy. And the half-steps might be bigger than my finger tips. March 23, 2019 at 12:19 AM · I respectfully disagree that a five-string viola would sound great on 2nd violin parts. We do play in high positions on occasion and we are also sometimes in unison with the firsts. We need to sound like the violinists we are. March 23, 2019 at 12:52 AM · I believe that the Viola Pomposa (for which the D-major "Cello Suite" was actually composed) was either a 5-string viola or a 5-string cello (Most commentators suggest the former). I'd like to make a 5-string viola or even, if a suitable bottom string was available, a 6-string viola - for improvisation, too (I improvise in church)! One that sounded GOOD! March 23, 2019 at 06:01 AM · Actually a C string might resonate quite nicely with second fiddle parts! My electric is a 5-string and the biggest confusion for me is to have a “middle string”! March 24, 2019 at 06:16 AM · Large instrument = more work, violin = more competition, viola is therefore a nice compromise. March 24, 2019 at 11:01 PM · Someone finally wants to make a bass! March 25, 2019 at 10:59 AM · I want to explore small size viola that sounds good for people who have small hands/fingers/etc. I was told that the "ideal" viola size is 20" long. While one can make compromise to get it down to a 16", I can't see why it can't by push further. Maybe a different shape, thickness or even material with different density can get it to work. March 25, 2019 at 08:31 PM · For many years I wanted to make a violin or viola. However I realize that at best it will be a mediocre instrument far inferior to the instruments I play. But recently I am starting to think that a viola d'amore would be a good project. It will also be mediocre for sure, but at least it will be the only of its kind in my possession. March 25, 2019 at 11:22 PM · I would make an electric violin, get the accoustics and electronics just right. 5 string to start off, then perhaps more. Ensure the piezo would not suffer the high pass filter characteristics. Actually this may turn into reality. I already play an accoustic violin. March 28, 2019 at 11:37 AM · Were I to make a bass it would be plywood. I've made so much furniture out of veneered plywood that I'd be right at home with that. I think it would be fun to make it out of treated CDX plywood. That would give it a really unique look.